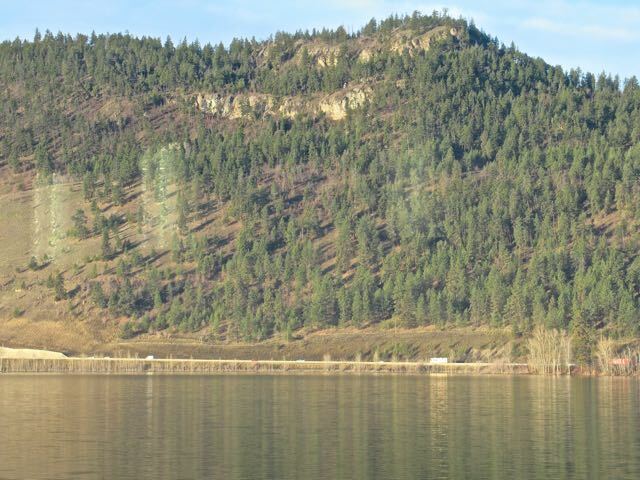 Hey that is our RV heading south ( larger white blurb on the right ) and I’m not in it. We had booked our annual service at Freightliner to coincide with Colin having to move the RV today as our three days were up parking in front of our house. More activity up the street. Good thing Colin was driving by 7:15AM. There are three trucks there. I think they are building a fence because of the tall posts. I did another three loads today. Here you see the 100% bamboo sheets we bought from a vendor at the Albuquerque Ballon Fiesta. I had to wash them before using them and they needed some TLC. First wash only in cold water. Then you are supposed to hang them outside but we don’t have a line here. 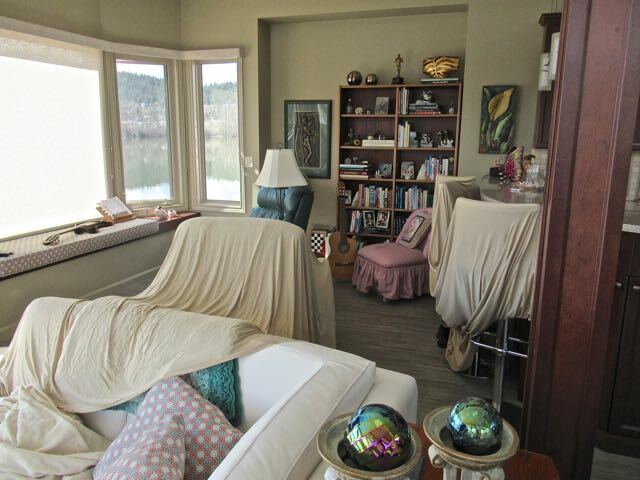 So I tumbled them for about 20 minutes on low and then hung them over the furniture. I later put them in for another 10 minutes before putting them on the bed. So silky smooth. Hope we like them. Yesterday evening I discovered that not all of our mail is here. I should have twelve Visa statements ( two different cards ) but only have two. I am missing between three or four months of banking statements for both bank accounts as well as for two cell phones, our home phone, our business phone and the list goes on and on plus National Geographic and two different RV magazines. I always come home to a few Christmas cards and there were none this year. My greatest concern is, what else is missing that I can’t figure out. I later figured out at least two other things and am working on others. This morning I spoke with the local postal outlet and they confirmed that on November 8th all the mail in our overstuffed mailbox was removed and on December 6th was returned to sender. I was told that likely other pieces were sent back as well. I think there may have been a pick up end of November as I had two months of missing statements and then suddenly something and then nothing again. So it has taken me all day, well at least nine hours, to go back in my files to determine the last statement I had. Then I noted what I actually did receive when we were away and then figured out which months I was missing. Then I began calling everyone involved. The bank was the nicest and said no worries and printed out new statements for us and they were ready end of day today. Most places were sympathetic and some are mailing statements, others emailed them to me and others guided me thru an online process to find them and print them. The worst was our Visa company. Third degree etc. Plus they say it has nothing to do with them as to why we are not getting any statements at all. I kindly suggested that they might have stopped mailing ours as we have received January, February and March from everyone else. They will email me the statements in fours days and hopefully they will resume mailing our statements. The onus will be on me to be aware of that for the next month or so. Of course with us leaving in six weeks it may still be a nightmare when we get back. 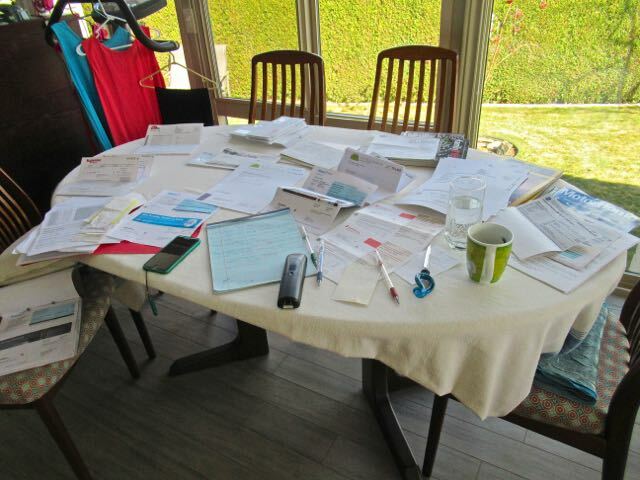 It was easier to work from the dining room table where I could spread out. At one point I had to use both the house phone and my cell as one Shaw account had a 45 minute wait and the other a 60 minute wait and both offered a call back which was great. So I got some laundry done in between and sourced out possibilities to call tomorrow. I am nowhere near done. This is taking two full days of my time. I did hire these people as in pay them to look after our mail and home. However it is just something that happened and I have to simply deal with it. But is does delay me getting our taxes done. 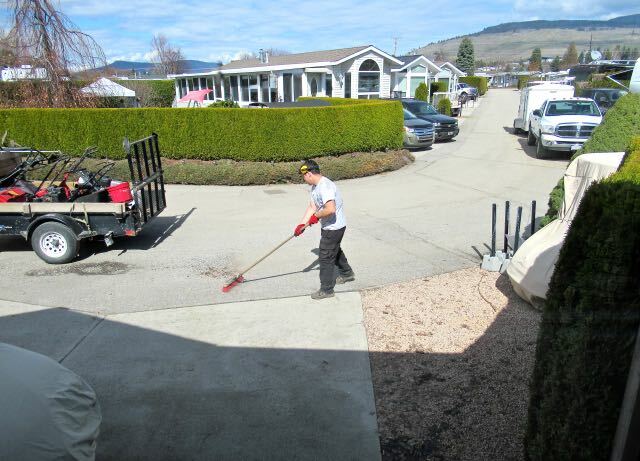 Our yard boy, as Norma would have called him, came by and the first thing his helper did was sweep up the winter road gravel that our RV had blocked the street sweeper from reaching. Nice, now Colin won’t have to do it. They dethatched the lawn, so much came out. Then aerated and fertilized. We should be looking green real soon. 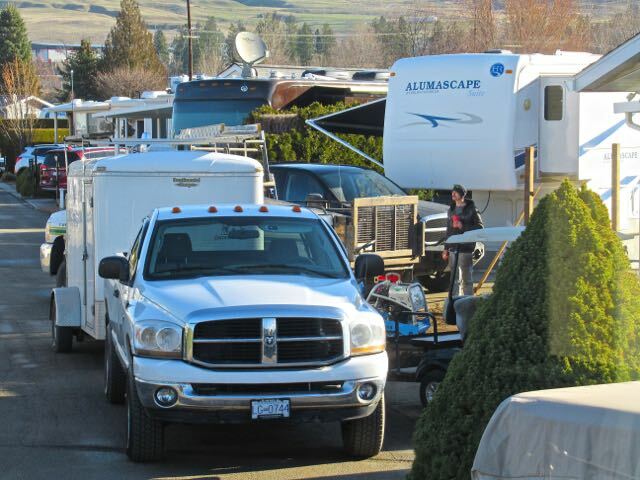 Meanwhile I called the front office and arranged for Colin to be able to park in the RV front overflow for the night at no charge. It is too much trouble to park in our storage spot now that they are much smaller ( after the flood two years ago they redid the storage area to fit more units = smaller spaces ). So we have been hard at it since he got back and here we are yet again at 9PM. Time to make dinner. Another early morning tomorrow. Check in tomorrow for the sequel……. Will be nice to get things all straightened out and carry on with life. Since we are away from home a fair bit I have switched all my statements (except bank) to email notification. Then I go online and check the statements and print them out if I find it necessary. It sure has decreased our mail considerably. Initially I resisted doing it this way but find it is working out much better for us. How very frustrating for you what happened and so time consuming now tracking it all down. Being away is great but the mail issue is a concern, I understand. The thing is we are an incorporated company and need all of this on paper for our year end. I don’t want o have to be dealing with printing out everything out when I can already have it sent to me on paper. We have been doing this for 20 years now and it has worked for us until now. We are fulltime, and every credit card and bank account was switched to Online statements. I just had no place to Store everything. Anytime I need anything like a statement, I simply go online and print it. You only need those statements in case of tax audit, and can get them online. We also keep a UPS mailbox in Tucson in case we need something during the winter. If we did not have a business that I need hard copies for then I would do it all online. Sometimes I have to move personal thing to the business area, etc. We can see out bank statements online at anytime but not our credit statements. Because I have paper billing I can only see the current month on line and I do give that a glance to make sure nothing outstanding had occurred. I also need to separate out the GST tax as it has to be remitted separately from every single purchase that we make including telephone, internet, etc. I think that once we are retired things will be simplified. Can you have the post office hold your mail next year? I am not sure they can for that long. Too bad you can’t rely on people but tough in a separation situation. Weird, our cc companies have our statements online (we do almost all of our banking online) and I can just print them off. 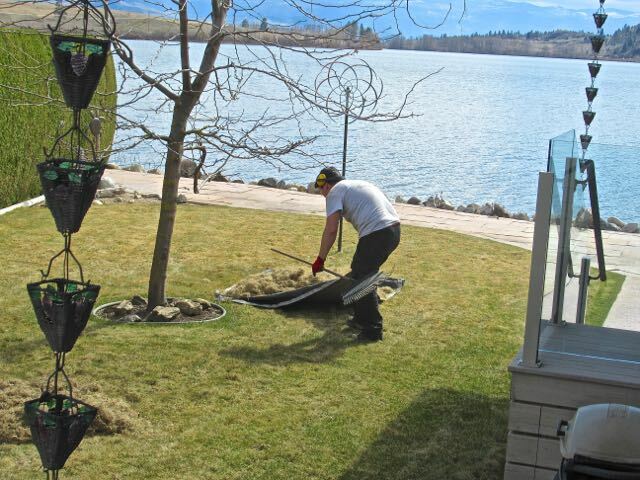 We thatched both front and back lawns this week (2 separate days) and boy is that alot of raking work. We did it right before our rain hit though and the lawn will be better for it. We only aerate every 2nd or 3rd year. I asked the post office about that yesterday and the cost is $10.00 per week. I still need to pay someone to check our house every now and then so it makes sense to include mail pick up in that. We had to make a choice with the credit card copies to have paper or online billing, you can’t have both. We have been getting our E-Statements for quite some time. When we go south the Place where our mail is delivered every month puts everything in a sealed box for us. That will be our first stop once we are back in Ontario. You will love the Bamboo Sheets. We find them more comfortable then Linen Sheets. The first night was great but I kept struggling with the slippery sheets. I haven’t had a chance to ask Colin his thoughts. He was gone very early back to Freightliner. How about a UPS store? The post office here will hold all of our mail up to like 6 months as long as we put it on a “Vacation Hold” but you folks in Canada sure seem to be cleverly tasked to give up some of your money like us. Consider reading up on the Tank Tech RX that stuff can be left in the tanks even when they are full and it will continue to clean the tanks, it is probiotics for the RV tanks and with use of it, an RVer can go a couple of years at a time without cleaning the tanks with high-pressure cleanings. Great stuff! Enjoy your trip and glad you all made it home safely. Some countries, such as Mexico, now do all taxes via the internet and all invoicing is online. We don’t even send anything to the accountant anymore. Well, partially true. We send our bank statements, that are online, via email and any invoice that we have requested for any purchase is listed in the bank statement because all our deductibles, receipts, and payments have to be done with a debit/credit card. The system of Hacienda (Mexican IRS) automatically matches the buyer/seller invoice with the purchase or charge invoice for verification and allows the accountant to make a decision as to what is deductible. No more printing, no more paper, it’s all electronic. Mexico has its pluses and this is one. Funny that Mexico can do this but Canada and the U.S. haven’t gotten there yet. Sorry for the long post!